Twitter spammers are at it, again. If it wasn’t enough with the Twitter direct messages (DMs) with offers about “making money with Google” or “make $500 a day online”, now there are more kinds of Twitter spam that you can add to your list. Here is a review of 3 new types of Twitter spam. 1. Direct Messages (DMs) asking to log in to a fake Twitter.com. This an oldie with a new twist. Biz Stone, co-founder of Twitter, and his Twitter engineers warned us back in January 2009 about this type of spam. This DMs link its clickers to some Twitter lookalikes asking to re-enter your Twitter log in information. Here’s how to spot the fake Twitter pages: check your URL bar for funny looking URLs such as http://twitter.access-logins.com. The only correct URLs for logging in to Twitter are http://www.twitter.com and http://www.twitter.com/login. 2. 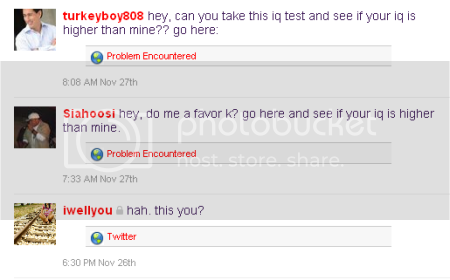 Direct Messages (DMs) asking for your IQ or whether it is you in a picture. Is your IQ higher than mine? Delete the DM and ask your follower to read these 4 Steps to Get Rid of Twitter Spam because he/she might not realize that he/she has granted access to his/her Twitter account to a malicious Twitter app developer. Help your followers, it’s good karma. 3. Fake cuties, even faker Twitter accounts. Pictures of good looking guys and gals. This form of spam is aimed at people that take a look at the trending topics. 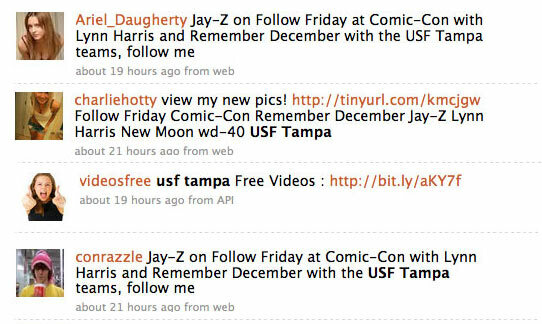 In this example, the trending topics were Comic-Con, USF Tampa, Jaz-Z, Follow Friday and Lynn Harris. 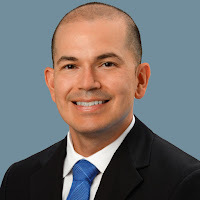 By adding a profile pic that is easy on the eye, the Twitter spammer expects that somebody will be curious enough to click on the malicious links. I hope that this list of 3 new types of Twitter spam help you avoid malicious activity from Twitter developers. 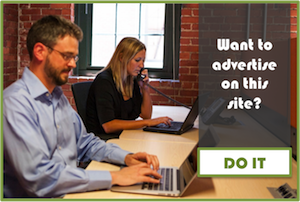 If you like the article, share it with your friends using the social media bar below. The third one is NOT new at all. I try to check as many people as I can that is following me before. I follow back. I look at their profile, and what type of tweets they write. I’ve often blocked those so called good looking people that have irrelevant info or none at all, fake names or no name whatsoever. I think I’ve seen all of these. ugh! All three of these seem to be prevalent on twitter… I guess it comes with the popularity of twitter. I try to spend an hour on the weekend following back new followers from the week. I know I miss some people I should follow doing this but it seems to save me on spam!